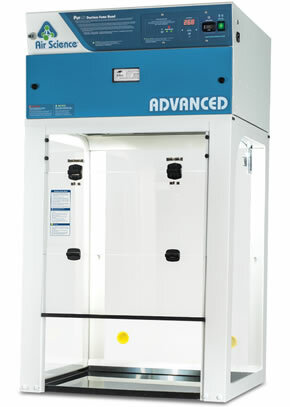 The Purair® Advanced Series ductless fume cupboards are a series of high efficiency products designed to protect the user and the environment from hazardous vapors generated on the work surface. 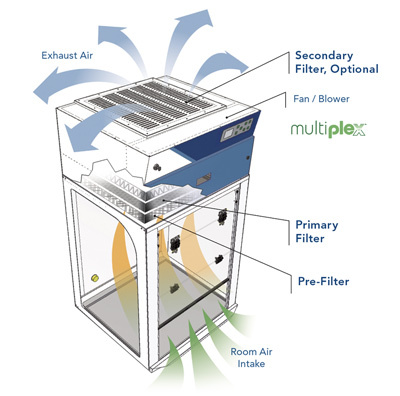 At the heart of the Purair fume cupboard product line is the innovative Multiplex™ Filtration Technology that creates a safe work environment over the widest range of applications in the industry. 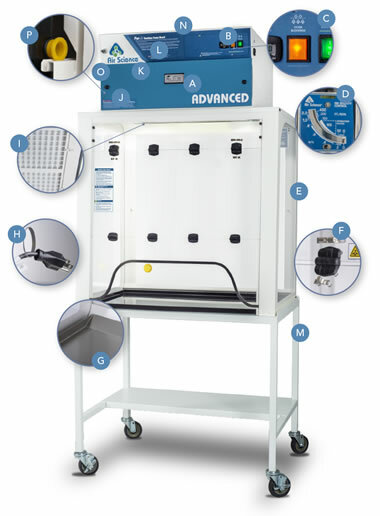 Purair Advanced ductless fume cupboards and chemical processing workstations are available in 21 standard sizes, in metal or polypropylene construction, totaling 42 standard models. 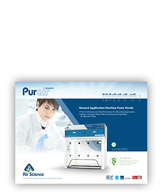 Purair Advanced product line is available in seven standard sizes. 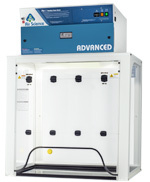 SafeSwitch™ Filter Shutter System (optional) for safer bag-out filter exchange. Accessories include an optional filter saturation alarm and optional back-up filter. Purair P15-XT, shown with optional mobile cart. G. Work Surface: The internal work surface is fitted with a standard polypropylene spill tray (available in white and black). An optional stainless steel tray is also available, see accessories. L. Internal Manual Speed Controller: Authorized personnel may set the EC motor speed as desired. O. Air Sampling Port: A filtered air sampling port allows manual filter monitoring. P. Track & Wheel System: The filter glides in on a wheel and track system, then clamps tightly against the filter gasket to prevent filter tears and maintain filter integrity. 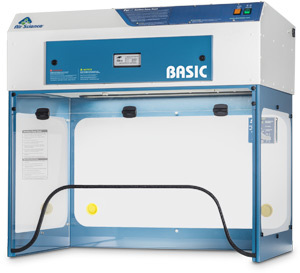 SafeSwitch Bag-out Filter Replacement: The optional Air Science SafeSwitch™ filter replacement system minimizes exposure to filter contaminants when removing used carbon or HEPA filters for insertion of new filters. When replacement is required a draw cord manually activates an internal louver set to close the filter face for easy bag-out recovery. See Options.